I’m watching the Olympics. I’m almost overwhelmed by choice, but right now I’m watching the Fencing. Men’s Individual Foil if you enjoy that kind of thing. It seems I do. The Italians are pretty good at this sort of thing, so here’s an Italian wine. We drank it in Italy, so it tasted great. That is something of a problem with wine assessment. On a beautiful warm evening, sitting by Naples Bay with Vesuvius in the background, a bottle of 7-11 own brand white zinfandel would probably taste good. 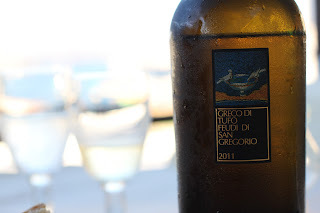 The restaurant we were at didn’t serve it though, so I opted for Greco di Tufo as it didn’t have to travel very far. There were no vineyards in sight, although we’d seen a few on the slopes of Vesuvius, a clue to the fact that we’d got on the wrong train to Herculaneum. Never mind, it was great to see, along with tomatoes and melons and figs and oranges all wonderfully ripe and growing like weeds. The wine was good. Fresh, fruity, grapey and a smidge minerally, but maybe that was just me, imagining volcanic flavours in the wine, imagining Romans enjoying wine made from the same grapes, or even Greeks. Wine tastes better in great location with great company. The Olympics is better in your home country, even if you can’t see it all in person. I can’t believe that Americans can’t watch the Olympics live, my European brain can’t comprehend the commercial logic, I feel bad for the USA, but at least Americans don’t have to cope with the horrible problem I’m now faced with after (spoiler alert) the South Korean beat the Italian in the quarter final – which of the 25 BBC live Olympics channels shall I watch next?